On March 25, 1776, only eight days after the British evacuation of Boston, the Continental Congress authorized a medal, "George Washington before Boston," to commemorate the event. 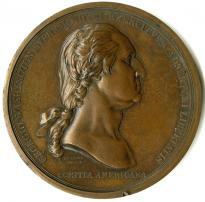 During the war, Congress commissioned eleven medals in the Comitia Americana (American Congress) series depicting generals and important battles of the American Revolution. Most of these medals were made in Paris. Although Congress order authorized this first medal in 1776, the first one, in gold, was not presented to Washington until 1790. Many bronze copies of the medal were also made to be given out or sold. The image on the front is a profile of George Washington from a bust sculpted by Jean-Antoine Houdon at Mount Vernon in October 1785. 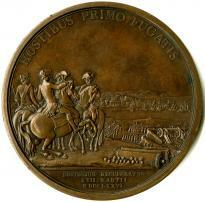 The sculpture was then sent to Paris in January 1786 to be copied for the medal. The Latin on this side translates as: "The American Congress" ("Comitia Americana") and "The American Congress to George Washington supreme commander of the army [and] defender of liberty" ("Georgio Washington Svmpremo Dvci Exercitvvm Adsertori Libertatis"). The back of the medal shows an engraving of Washington on Dorchester Heights overlooking Boston harbor with four of his officers, all on horseback. Regimented lines of American troops gather below Dorchester Heights. Washington is pointing toward the British fleet, which is leaving Boston nearly a year after the Battles of Lexington and Concord. On the right side of the medal are four cannon—two behind a parapet and two on the ground beside Washington—representing the British artillery taken by the Americans at Fort Ticonderoga. Henry Knox and his men dragged the cannon across New York and Massachusetts in the winter of 1775–1776. These cannon sitting high above the harbor threatened the British fleet, forcing them to flee and abandon Boston. The engraver, Pierre Simon Benjamin Duvivier, put his own name on one of the cannon. The inscriptions on the back read: "For the first time the enemies are put to flight" ("Hostibus Primo Fugatis") and "Boston retaken /17 March /1776" ("Bostonium Recuperatum / Xvii Marti / Mdcclxxvi"). The members of the Continental Congress recognized that Washington’s victory in Boston would rally colonists to support the Revolution. Americans have often memorialized heroes by placing their images on medals and coins. Today the coins used in the United States include images of Presidents Washington, Roosevelt, Jefferson, and Lincoln, and presidents and other important figures are commemorated on paper money as well. Who is being honored on the front of the medal? Carefully examine the image on the reverse. Make a list of everything you can clearly identify. What event is shown? ** Use the translation of the Latin in the introduction to answer this question: Why did the Continental Congress consider the person and the event important enough to create this medal? How do we honor a military hero today? Select a coin or paper bill with the image of a famous American. Explain why that person has been honored.